A contemporary loft extension and interior design to a Victorian property located on Stonenest street in between Finsbury Park and Archway in Islington, London N4. The project includes a bespoke staircase fabricated from steel and copper shingles as exterior cladding. The ambition for this project is to adapt and extend a traditional family home for the clients growing family. The project is small in scale but large in architectural ambition. It includes a single storey rear extension on the 2nd floor to create a small lounge and study and the erection of a rear mansard roof extension to create a new guest suite including a bedroom, ensuite and walk-in wardrobe. A copper shingle cladding is proposed for the 2nd floor extension to mirror the distinctive colour of the neighbouring copper roof of the local New Court Christian Centre and copper main doors of Catholic Church of Saint Mellitus; creating a positive contrast with the existing building. 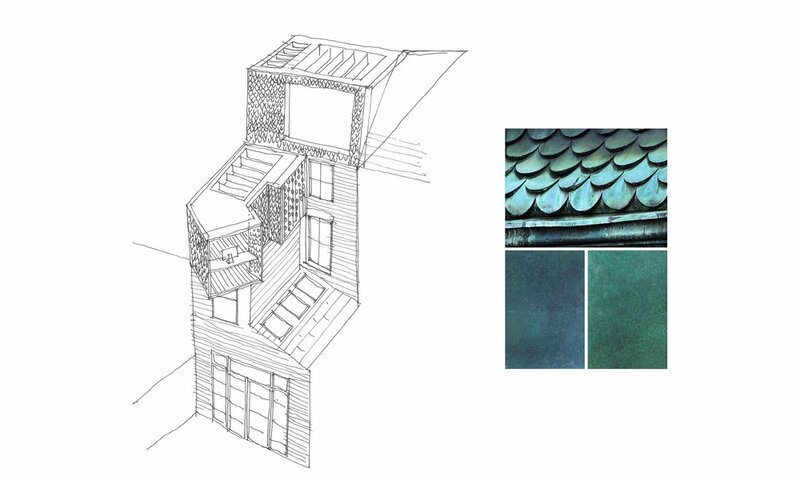 The shingles will be finished in a oxidised green finish of varying levels of patina and hue and will be randomly installed to give depth and a richness of colour and detail. It is also proposed to clad the mansard extension with grey zinc shingles to mirror the adjoining roof colours. The geometry of the second storey extension is is twisted to align with the rear elevation of the Church of Saint Mellitus. Internally, this creates a niche for a study area and a framed view of the church. From the exterior, this will create a distinctive and dynamic shape, cantilevering the massing over the existing building line enhancing the local distinctiveness of the streetscape.